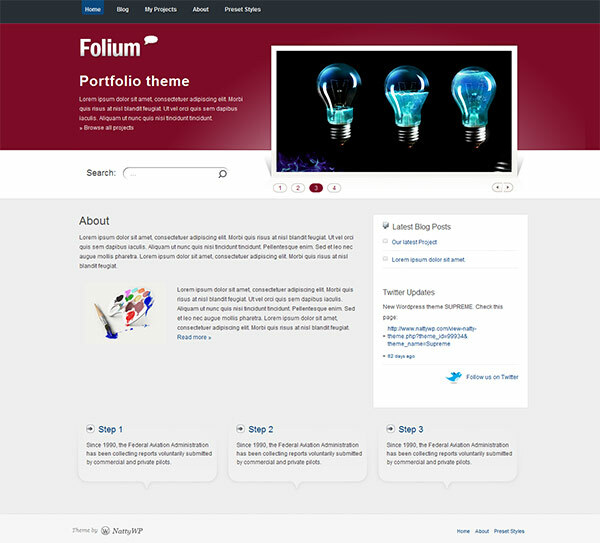 Folium is clean and stylish portfolio based theme. With help of this theme you can easily promote your work, no matter what specific area or field it is related to, with the help of this theme you will get a great presentation of your work or products. The Folio theme comes with a unique portfolio oriented layout with advanced Blog and Portfolio categories, so you can easily separate your blog and portfolio content. There is a home page slider with scroll feature displaying your latest projects, a page based homepage displaying specific page that have been enabled in the backend theme options panel. You also get 3 widgetized sub-boxes at the bottom of the homepage to present the visitor with a list of services or benefits of your company/product and you can control the visibility of this module. There are also 5 additional widgets and 6 different widget spaces as well as 3 additional color schemes.